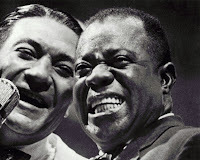 Louis Armstrong believed he was born on July 4, 1900. Subsequent historical research might suggest otherwise, but why get hung up on mere details? A true Horatio Alger figure, who revolutionized both instrumental and vocal music, and represented America abroad as the unofficial “Ambassador Satch,” it is a symbolically fitting birthday for Armstrong, so I always listen to his music over the holiday. This Fourth of July you can see him on the big screen when the Lincoln Center’s Walter Reade screens Bert Stern’s celebrated documentary Jazz on a Summer’s Day. 1958 was a busy Fourth of July weekend for Rhode Island. In addition to George Wein’s Newport Jazz Festival, America’s Cup qualifying heats were running off the coast. Part of Summer’s charm is the way director Bert Stern incorporates not just the races, but all the life and carousing going on around the festival. Jimmy Giuffre might not be widely known outside of jazz circles, but his performance of “The Train and the River” was an inspired choice for the opening credits. Breezy and bluesy with a hint of abstractness, it perfectly matches Stern’s images of the ocean and his wavy titles. This was Giuffre’s most accessible combo, a trio of himself on reeds, Bob Brookmeyer on valve trombone and Jim Hall on guitar (visible only when taking a bow at the end of the number). As many times as I have seen this film, this sequence always draws me in again. In retrospect, it seems weird Thelonious Monk was scheduled so early in the festival. We see him playing to a sparse audience that included an appreciative Gerry Mulligan, who would take the stage later that night. Monk’s performance of “Blue Monk” and VOA D.J. Willis Conover’s introduction might actually sound familiar, having been sampled in a sneaker commercial. 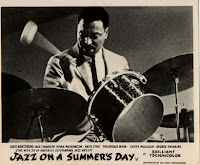 Festival attendees were indeed fortunate getting a chance to hear future legends in sideman roles, most famously including a young Roswell Rudd, later to become the most important trombonist in the avant-garde, seen in Newport careening around the roads with the Dixieland band Eli’s Chosen Six. We also hear working bands that sadly never recorded outside of Stern’s film, like the group co-led by Sonny Stitt and former Kenton guitarist Sal Salvador, stuck with the dreaded “under-appreciated” appellation throughout his career. A young Eric Dolphy also appears in a sideman role with Chico Hamilton’s band. Stern uses the Hamilton group as a touchstone throughout the film, juxtaposing their serious rehearsals with the revelry of the festival. I often use their performance of “Blue Sands” as an ace-in-the-hole in my jazz survey courses. The combination of the exotic sounds of Dolphy’s flute and Nate Gershman’s cello combined with Stern gorgeous color photography is always a knockout punch. Of course the biggest star was Louis Armstrong, performing in the film’s penultimate timeslot for a clearly adoring audience. As Armstrong plays and relates anecdotes of hobnobbing with crowned heads of Europe for Conover, the film establishes him as uncrowned American royalty. After Armstrong’s Saturday night set finishes past midnight, Conover gives Mahalia Jackson probably the best stage introduction ever, ending Summer on Sunday morning with a gospel note. Summer is a classic. For all the times I have watched it for use in a class, I still enjoy it like I’m seeing I for the first time. It is patriotic movie too. After all, it honors America’s only original art form: jazz. It screens four times today at the Walter Reade, with Stern and Wein appearing as honored guests for the 6:00 show. Happy Fourth of July.